A 24-year-old primiparturient with suspected acute stroke was transferred urgently to the consultant-led obstetric unit following normal vaginal delivery of a healthy baby under midwifery led care. The patient had no significant medical history and, other than having a low body mass index at booking (17 kg/m2) and delivering a large baby (>90th centile), she had undergone a normal pregnancy and delivery. Immediately following delivery, the patient developed facial asymmetry with left-sided swelling and drooping, and altered voice. Urgent clinical assessment revealed cardiorespiratory stability and, other than mild dysphonia, no evidence of acute stroke; there was marked surgical emphysema extending from the chest up to the face. A portable chest radiograph demonstrated surgical emphysema but no evidence of pneumothorax. Ruptured oesophagus was suspected and a CT of the neck and chest with contrast was requested. This demonstrated pneumomediastinum, a small apical pneumothorax and no evidence of oesophageal rupture (figure 1). 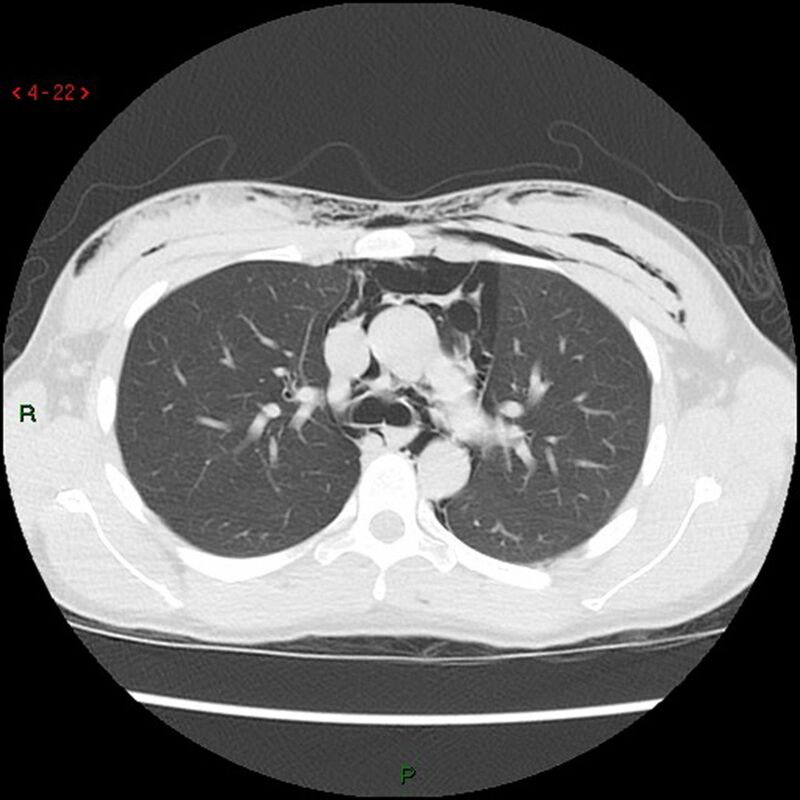 CT of the chest (axial slice at T5) demonstrating a small left apical pneumothorax, pneumomediastinum and extensive surgical emphysema affecting the anterior chest wall. The diagnosis of Hamman's syndrome was made and, following a period of observation and conservative management, the patient was discharged home with outpatient respiratory follow-up. Treatment is usually conservative, however, it is important to fully investigate such patients to exclude other diagnoses such as Boerhaave's syndrome, which may require surgical intervention.2 Extensive surgical emphysema may distort head and neck anatomy, with resultant facial and vocal changes suggesting neurological pathology (figure 2). However, thorough clinical examination should narrow the differentials and radiological investigation will confirm the diagnosis. Hamman's syndrome is a rare complication of normal labour. The diagnosis must be urgently differentiated from the more serious Boerhaave's syndrome. Extensive surgical emphysema may cause facial asymmetry and dysphonia, mimicking stroke. 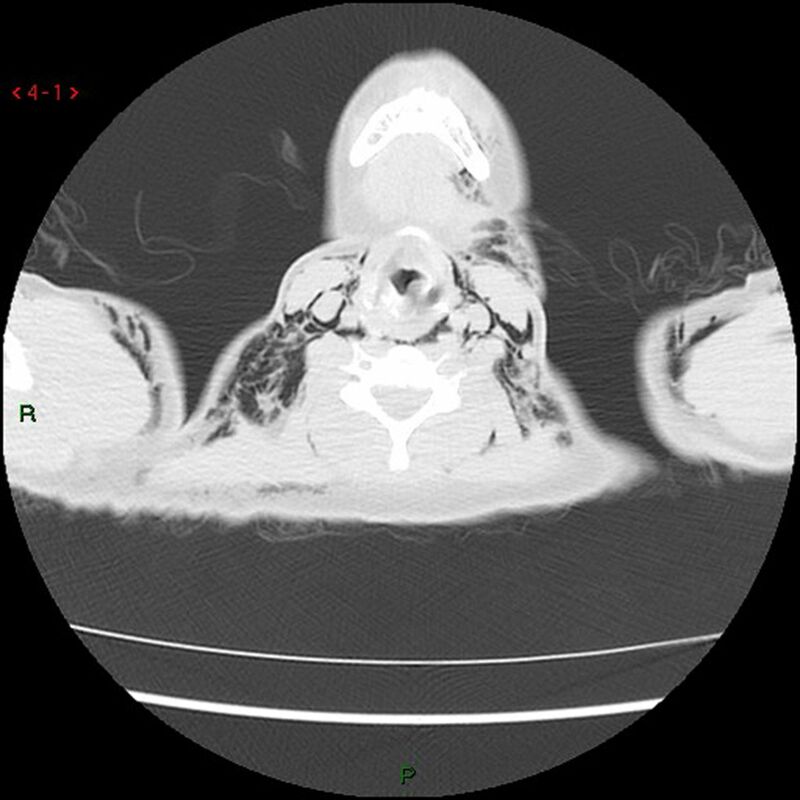 CT of the neck (axial slice at C6) demonstrating surgical emphysema in the neck extending towards the left side of the mandible and causing subtle left-sided compression of the larynx.
. Postpartum pneumomediastinum (Hamman's syndrome). J Obstet Gynaecol Can 2006;28:128–31. Contributors JW and RVH made substantial contributions to the conception or design of the manuscript. JW drafted the manuscript and RVH revised it critically for important intellectual content. Both the authors gave final approval of the version to be published and agree to be accountable for all aspects of the work in ensuring that questions related to the accuracy or integrity of any part of the work are appropriately investigated and resolved.